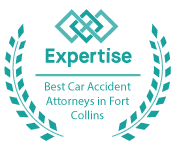 The law in Colorado is that all car crashes must be reported, no matter how insignificant they appear. The responding officer will take the parties’ information, take statements from any witnesses, and eventually issue a report. If possible, do not leave the scene without getting a copy of the report from the officer. This makes it more likely the officer will issue a citation and it ensures the case is handled promptly. The responding officer may also take photographs and any necessary measurements. The police will also issue any tickets to people who have broken the law or been negligent in causing the car crash. This will help you later in your case when you must prove that the other party was at fault for the crash. Once you have make sure everyone is safe and have called the police, it is a good idea to take pictures of your vehicle and injuries at the scene. We recommend that you take pictures of the outside of your car, even in places where there is no damage. If your airbags deployed or stuff inside your car moved around, take pictures of that. Politely and respectfully take pictures of the outside of the other car as well. Also look around the scene and see if there are any cameras that could have caught the crash on film. Take a picture of the camera’s locations so later your lawyer can try to get a copy of that video evidence. If you are visibly injured at the scene, take pictures of your injuries as well. As your injuries heal or if you undergo any type of surgery, be sure to continue to take photographs. Paramedics will often respond to the scene of an accident, even if injuries are not reported. Make sure you tell them about every symptom you are having, even if it is minor. It is important that you let the EMTs examine you for injuries, even if you don’t feel injured. They can look for signs of injury that you may not recognize or notice - this especially true with head injuries. If you are obviously hurt, take an ambulance to the nearest Emergency Room. If you don’t think you are hurt initially, closely monitor how you are feeling over the next few hours. Once the adrenaline wears off many people begin to feel pain from injuries suffered in the crash. If this is the case for you, seek medical treatment immediately when you notice these symptoms. It is best to go to an emergency room or urgent care to be seen immediately. Be sure to tell every medical provider you see about ALL your symptoms and be sure to tell them your symptoms started after the crash. Often the days and weeks following a car crash are equally stressful and hectic. It is always important that you call a good law firm to help you navigate some of the forthcoming confusion and contentious steps in your case. A good law firm can help take the stress off your plate and help make sure that you do not commit any errors that could negatively affect your case down the road. If you have recently been injured in a car accident, call Hoggatt Injury Law today!